Sandy Moats was born on December 4, 1921, in Kansas City, Missouri. He enlisted the U.S. Army Air Forces on May 23, 1942, and entered the Aviation Cadet Program on February 14, 1943. Moats was commissioned a 2d Lt and awarded his pilot wings on December 5, 1943, and after completing P-51 Mustang training, he was assigned to the 487th Fighter Squadron of the 352nd Fighter Group in England in June 1944. He was credited with destroying 8.5 enemy aircraft in aerial combat plus 1 damaged while flying 89 combat missions before transferring to Japan in July 1945. Capt Moats returned to the U.S. in December 1945, and served at Great Falls, Montana, until December 1946, when he went to Wheeler Field, Hawaii, to serve with the 91st Fighter Squadron of the 81st Fighter Group. Maj Moats served with this squadron and group at Wheeler AFB, Kirtland AFB, New Mexico, Larson AFB, Washington, and RAF Bentwaters, England, between December 1946 and September 1955. During this time he attended Air Tactical School, served as an exchange pilot with the U.S. Marine Corps, and commanded the 91st Fighter Squadron. He then served with Headquarters U.S. Air Force in the Pentagon, from September 1955 to November 1957, followed by service as commander of the 60th Fighter-Interceptor Squadron at Otis AFB, Massachusetts, from December 1957 to August 1960. Col Moats served as director of combat operations and later as director of operations and training for the 26th Air Division at Hancock Field, New York, from September 1960 to February 1963, and then was assigned to the Military Assistance Advisory Group for the Republic of China in Taipei, Taiwan, from March 1963 to July 1965. His next assignment was as vice commander of the 401st Tactical Fighter Wing at England AFB, Louisiana, from July 1965 to April 1966, and then as vice commander and later commander of the same wing at Torrejon AB, Spain, until November 1968. During this time, he flew 18 combat missions in Southeast Asia in 1965. Gen Moats served as vice commander of 16th Air Force at Torrejon AB from November 1968 to August 1969, and then as vice commander of 10th Air Force at Richards-Gebaur AFB, Missouri, from August to November 1969. He next served as commander of the 26th Air Division and 26th NORAD Region at Luke AFB, Arizona, from November 1969 to August 1970, followed by service as Chief of the Joint U.S. Military Assistance Advisory Group to Spain from September 1970 to October 1972. 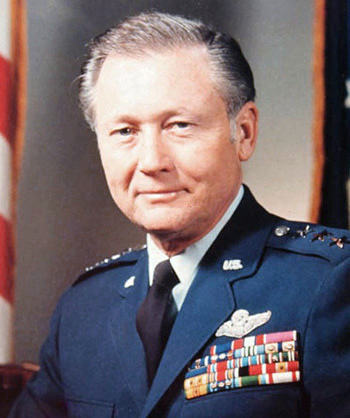 Gen Moats then served as vice commander and commander of 16th Air Force at Torrejon AB from October 1972 to August 1973, followed by service as commander of the 6th Allied Tactical Air Force at Izmir, Turkey, from August 1973 to August 1975. His final assignment was as vice commander of Tactical Air Command at Langley AFB, Virginia, from September 1975 until his retirement from the Air Force on July 1, 1977. The President of the United States takes pleasure in presenting the Distinguished Service Cross to Sanford K. Moats, First Lieutenant (Air Corps), U.S. Army Air Forces, for extraordinary heroism in connection with military operations against an armed enemy while serving as Pilot of a P-51 Fighter Airplane in the 487th Fighter Squadron, 352d Fighter Group, EIGHTH Air Force, in aerial combat against enemy forces on 1 January 1945, while leading an element in a twelve ship fighter squadron taking off on a patrol over Belgium. On this date, as he became airborne, Lieutenant Moats observed fifteen hostile fighters with an additional fifteen as top cover coming in to strafe the field. Unhesitatingly, Lieutenant Moats attacked and in the furious combat that ensued over a wide spread area where he was subjected alternately to friendly and enemy flak, he destroyed four enemy aircraft. Returning with his plane damaged by flak and entirely without ammunition, Lieutenant Moats continued to fly around the airfield simulating aggressive attacks on hostile aircraft until all enemy planes had been dispersed. The extraordinary heroism and determination to destroy the enemy displayed by Lieutenant Moats on this occasion are in keeping with the highest traditions of the military service and reflect great credit upon himself, the 8th Air Force, and the United States Army Air Forces.